Please join us for an artist talk with Lynn Batchelder on Sunday April 23 at 3pm In the Gallery at Brooklyn Metal Works. 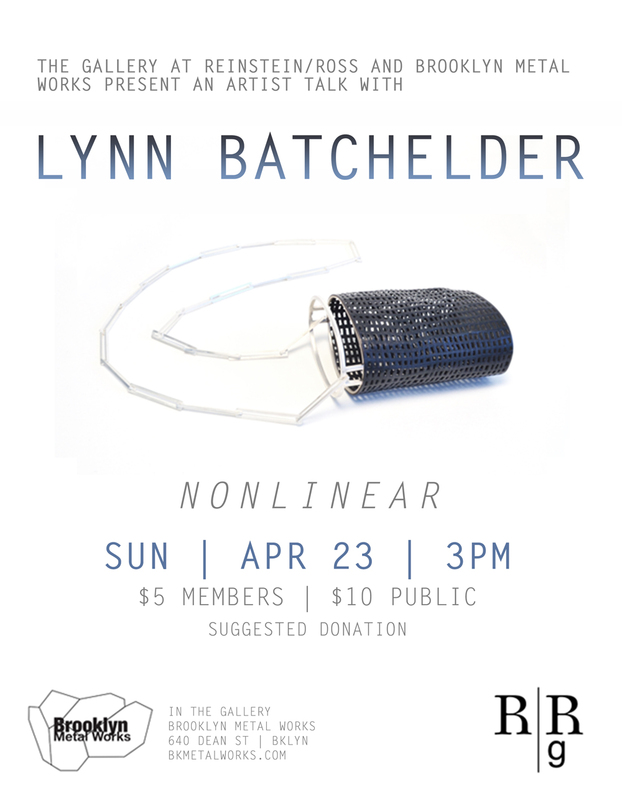 Batchelder will be giving a lecture about her work in support of her current solo exhibition “Nonlinear: New Work by Lynn Batchelder” featuring engraved prints, drawings, and jewelry at The Gallery at Reinstein|Ross. The two-dimensional and the three-dimensional carry equal weight in artist Lynn Batchelder’s practice. Batchelder’s new work explores the processes and tools that are shared by printmakers and jewelers. Nonlinear will feature drawings, prints, and four mini-series of jewelry pieces each inspired by modes of drawing expressed through a wide range of techniques. Batchelder says that her work is “rooted in the drawing process”, whether she is etching lines on steel or applying conductive paint with a brush onto wax prior to electroforming it. She sees similarities between the way a jeweler’s saw makes delicate incisions on a piece of steel and a burin, a small chisel-like tool, can be used to engrave the lines on a plate. Lynn Batchelder is a contemporary jeweler and educator residing in New York’s Hudson Valley where she is currently Assistant Professor of Art in the Metal Program at SUNY New Paltz. She is the recipient of the 2016 Art Jewelry Forum Artist Award and has exhibited her work in the prestigious Talente design exhibition at the International Trades Fair in Munich, and at SOFA Chicago. She has recently completed residencies at Women’s Studio Workshop, Penland School of Crafts (winter residency), and a year-long residency at the Arrowmont School of Arts and Crafts.